WooCommerce Gift Card allows the merchant to create and sell the multiple gift card type of products on their WooCommerce store. (1) Gift Card Product: A separate gift card type product is created in WooCommerce and merchant can create as many of product as he wants. 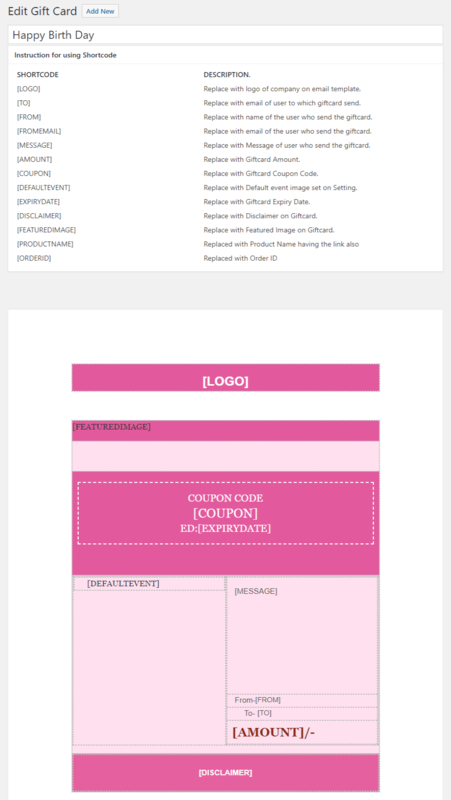 (2) Gift Card Template: We are providing some Gift Card templates. 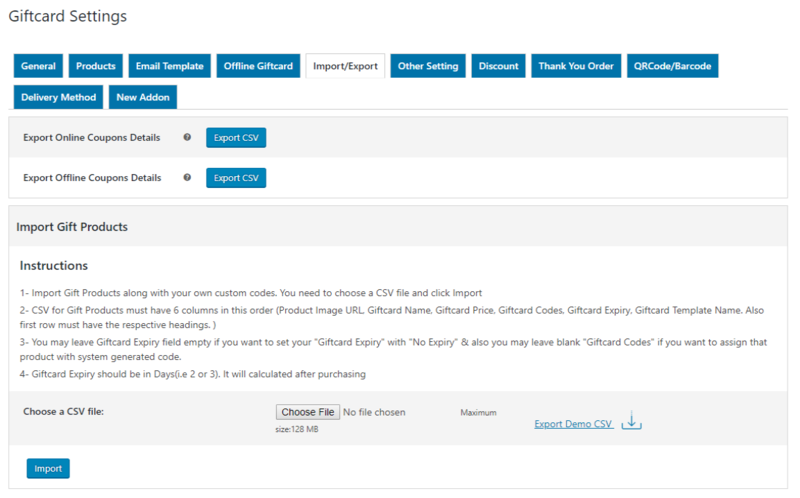 You can create a gift card product and assign suitable Gift Card Templates from the product edit page. (4) QR Code / BAR Code Feature: The QR Code/BAR Code is used over here for providing the security. ECC (Error Correction Capability) Level: This compensates for dirt, damage or fuzziness of the BAR Code. Valid values are “L” (low ECC), “M”, “Q”, “H” (highest ECC). A high ECC level adds more redundancy at the cost of using more space. Size: Option to enable QR Code after selecting ECC level to select the size of QR Code. Margin: Set the QR Code margin over here. Code Type: We have given some code type use for BAR Code, which is going to be used in different places for the different purpose. Enable BAR Code with Coupon Code: If the user generates their BAR Code with the Coupon code so here we give the option for the user. 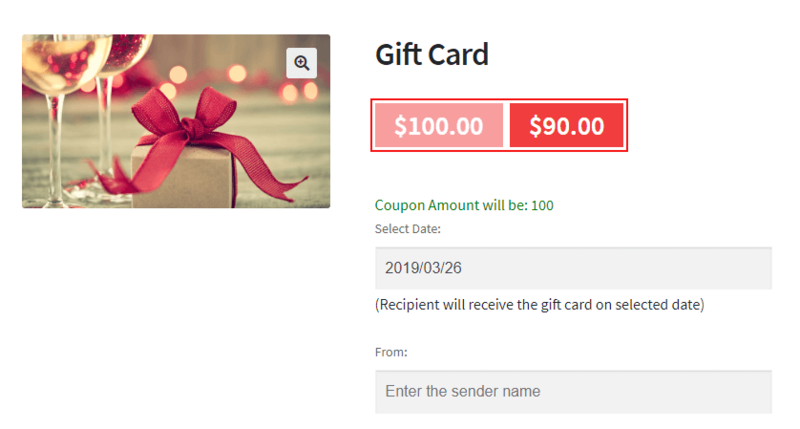 (5) Automatic Coupon Code Generation: When a gift card product is purchased and order is completed, then automatically gift card coupon code is generated and send to the mail to which gift card is sent. (6) Exclude Sale Items: The merchant can allow/disallow sales item from applying gift card discount amount. (7) Exclude Categories: The merchant can exclude categories to which he doesn’t want a gift card discount. When any excluded category product is available on the cart, then the gift card discount is not applied. (8) Exclude Product: The merchant can also exclude a selected product from gift card discount. When any excluded product is available on the cart, then the gift card discount is not applied. (9) Multiple Usability: A user can spend the whole Gift card amount in multiple times. (10) Expiry Date: The merchant can set after how many days when gift card product is purchased and the order completed then that gift card coupon is expired. (11) Cart Total Range: The merchant can set minimum and maximum cart total amount for applying the gift card discount. (12) Individual Use: The merchant can set whether the gift card coupon is used by a single user or multiple users. (13) Email Notification: A gift card template is sent to the user to which gift card is sent. Gift Card email template depends on the gift product. (14) Gift Card Scheduling: When this setting is enabled, the customers can select the date they wanted the gift card to be sent to the recipients. 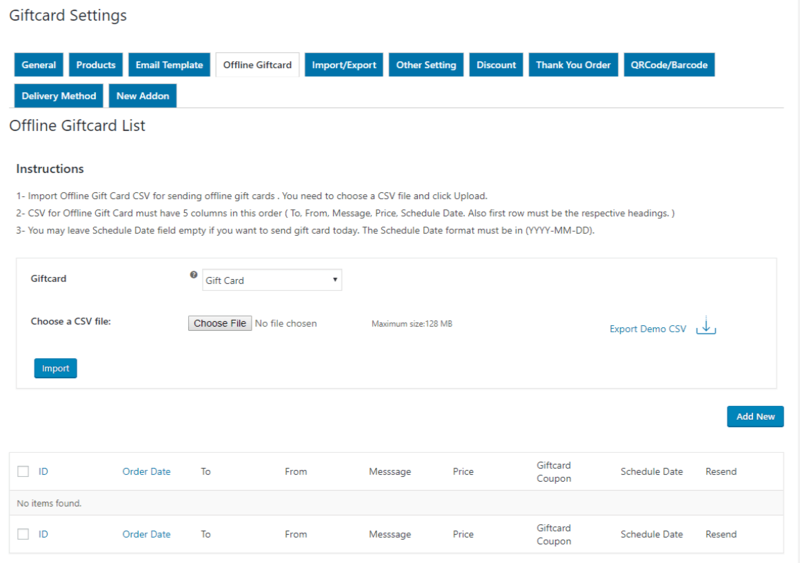 Customers can also send the scheduled Gift Card on the current day through the order details section. (15) Resend Email: If due to some reason gift card mail is not sent to the user then an option to resend the gift card email is available to resend that mail to the user to which mail is sent. (16) Export Online Gift Card Coupons Details: The Gift Card Coupon Details which are generated from the orders can be exported in the CSV format. (17) Import/Export Offline Gift Card Details: Admin can export the offline gift card coupons details from the Export Coupon Tab section. You can also import the Gift Card coupon details into the offline gift card table, from the Offline Gift Card Section. 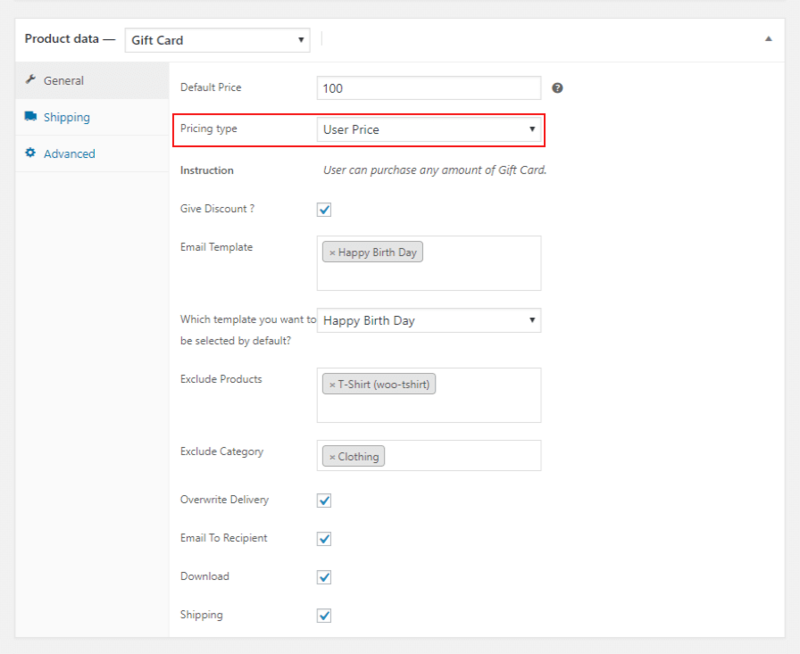 (18) Resend Gift Card by adding more amount to the coupon: Admin can resend the unused Gift Card Coupons to the recipients by adding more amount of the coupon from the order detail section. They can select multiple gift card coupons and assign a similar amount of all coupons. (19) Date Formatting: The merchant can set the date format they want to display in the front-end. 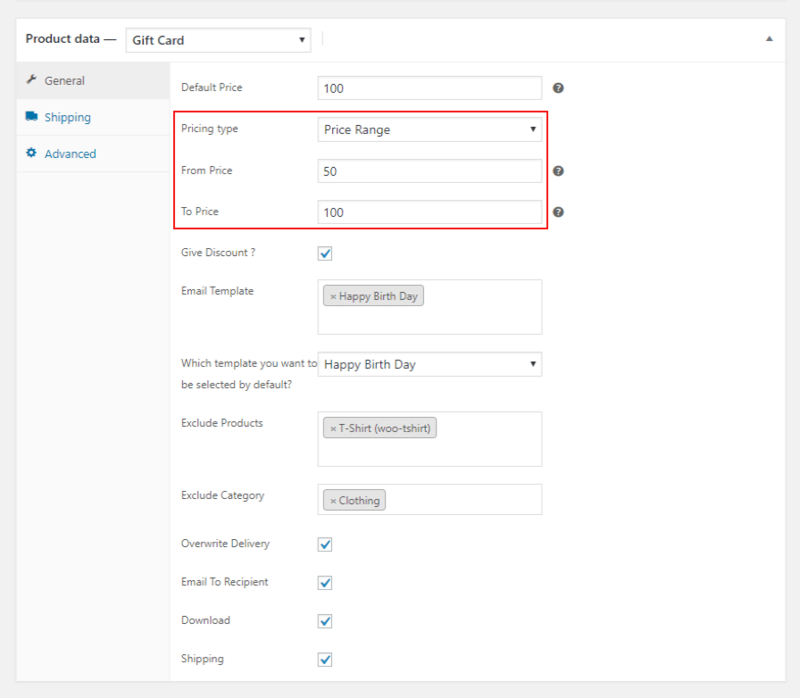 The expiry date in the Gift Card Template will be in this date format if this setting is enabled from the backend. (20) Gift Card Message Length: The merchant can set the Gift card message length by setting. The Default length of Gift card message is 300. Along with this, we have provided the customers to check the current count of the message characters. (22) Browse image for Gift Card: The customer can also set their gift card image. (23) Shipping Feature: The shipping feature use over here for gift card shipping. It is for admin and the buyer. 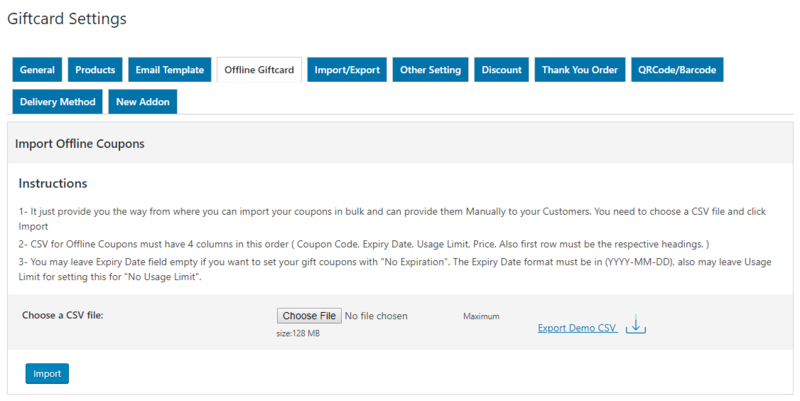 Coupons: After enabling the shipping feature you can use the coupon for gift card shipping and tax. (24) Disable Category Feature: Now admin can assign more than one category to the Gift Card product. (25) Coupon Mail Setting: The user will get notified of their email by each usage of coupon amount. Now the user can check how much amount is left on their coupons. (26) Other Setting: In this setting, we provide some extra options i.e. ; BCC, Enable/Disable some option that user need to change. (27) Delivery Method: In this setting, we provide three delivery options to the sender that he wants to need to send their gift card email to the recipient. 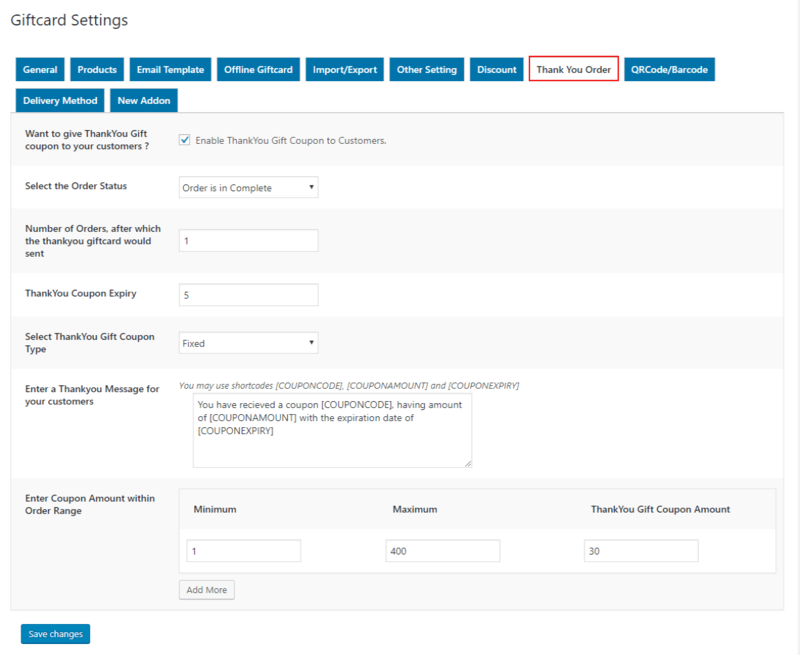 (28) Discount Feature: In this feature, admin can set the minimum and maximum discount amount. Here we provide the Two types of discount i.e; Fixed and Percentage. 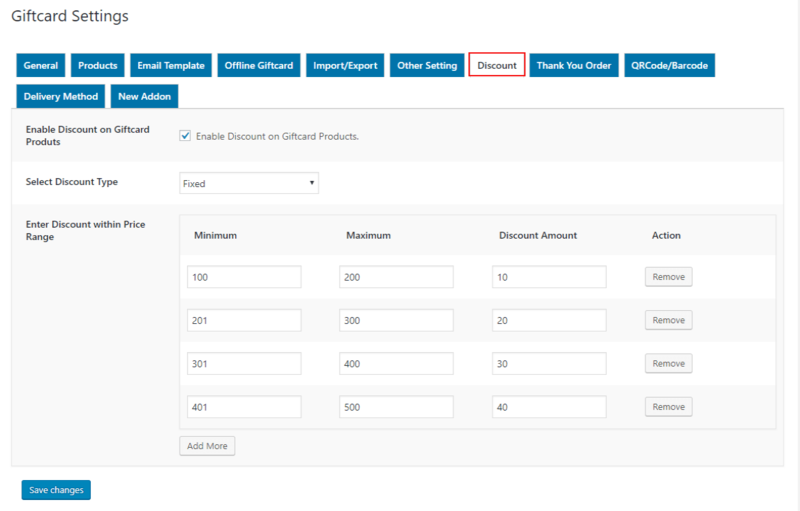 Admin can enable discount setting per product wise. (29) PDF Feature: After enabling this feature customer will get an email along with PDF attachment. You can choose an A3/A4 size for PDF. 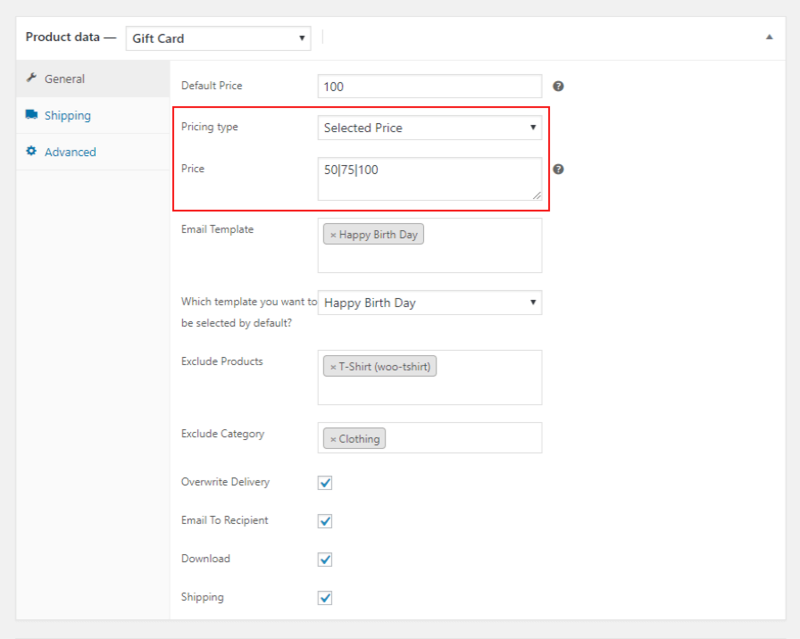 (30) Exclude Product Feature: In this feature when products are assigned any gift card (Per Product Setting), then the generated coupon will not be applied to the assigned product as well as the category. (31) Shipping Class Feature: In this feature, you can add a shipping class and apply it to gift card products. (32) Thank you gift coupon Feature: The merchant would be able to send Thank You gift coupon to their regular customers, who have placed the required number of order for that coupon. (33) Validation may turn On or Off: Now merchant can turn On or Off the validation from a single product page. (34) Multiple templates for the customer: From now onwards, the merchant can select multiple templates for Gift Card and customer would be able to choose from them. (35) To Name Filed for “Mail to Recipient Option”: Any customer who wants to send a Gift Card to his/her friend via mail to recipient option, then now onwards they can fill his/her friend’s email id along with the name, the mail was sent to that email id and the name would get displays in templates. 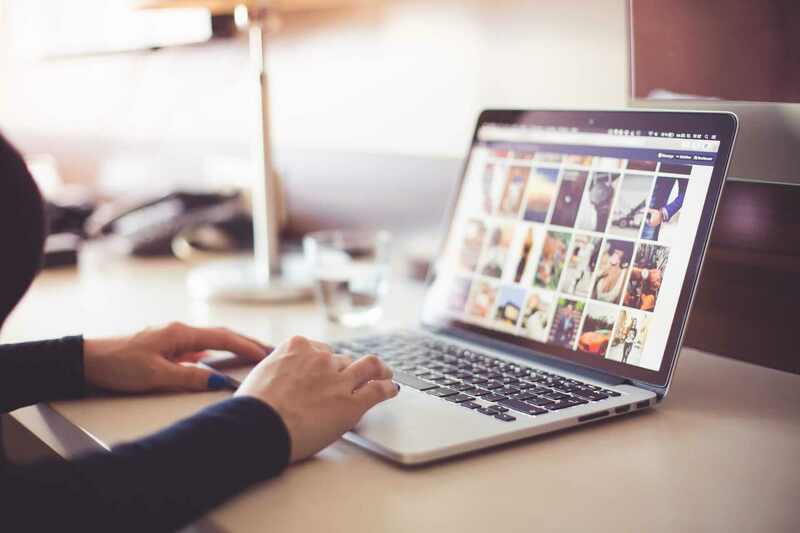 (36) Recipients Email Editing: From now on Admin would be able to edit the recipient’s email address and after the successful operation, he has to resend once. (37) Tax Calculation: In this version, we provide the tax calculation for Gift Card Products. 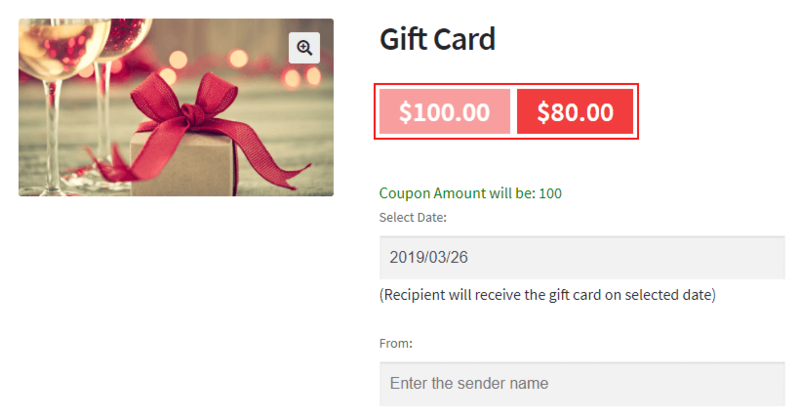 (38) Gift Card Coupon Filter: From now on Gift Cards can be easily filtered by the provided setting, You may easily filter-out the Online/Offline/Imported Gift Cards among all of them. (39) Email for Ship Your Card Delivery method: From now on email id can be changeable by Merchant easily, Whatever Email id has been filled in the given textbox, the Mail will get sent on that Id. (40) The number of E-Gift Cards: From now onwards, E-Gift Cards will totally depend on how much quantity you had purchased, In short, the number of Gift Cards is depended upon the number of quantity has been added. (41) WPML/Translation: The system is fully compatible with WPML Plugin and we also come with multiple languages supported .po and .mo files like for Germany, France, Spanish and English. (42) Addon: From now we are providing a Giftcard Addon WooCommerce Customizable Gift Card that allows your customer to customize their Gift Card template easily. 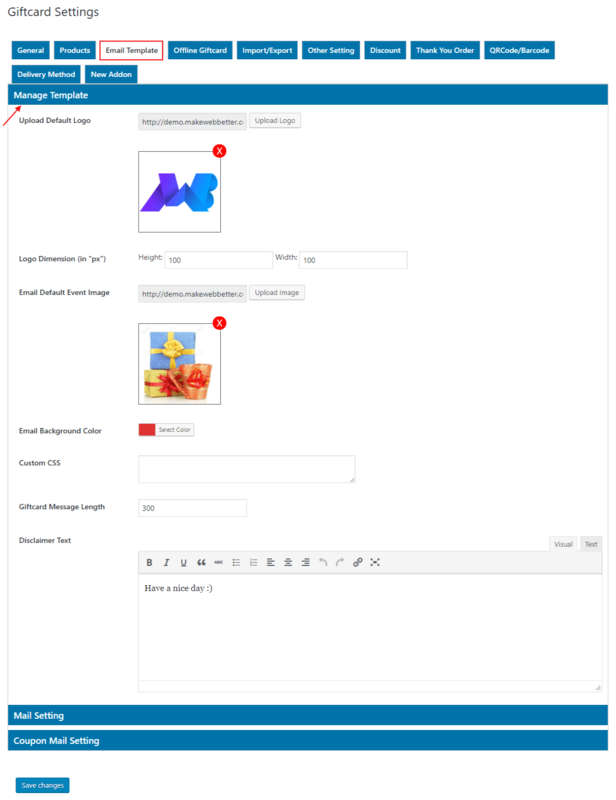 Where the admin can easily provide pre-defined images as well as upload more images for your customers. This Addon gives the ability to your customers to also upload their own Gift Card images and make changes in real-time. 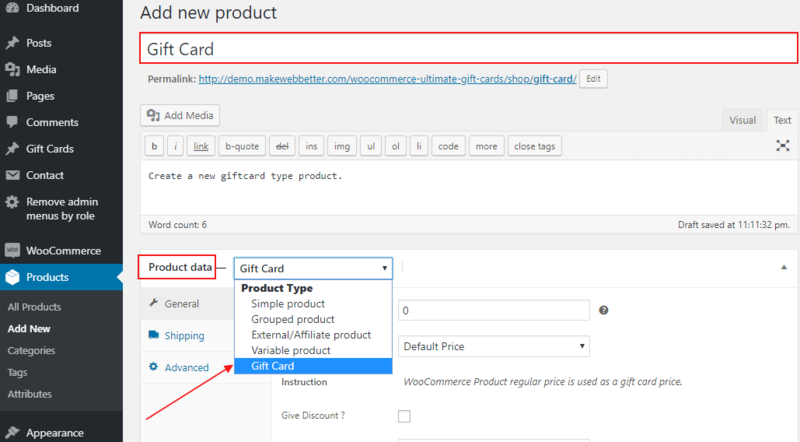 (i) Download the zip folder of the plugin WooCommerce Ultimate Gift Card. 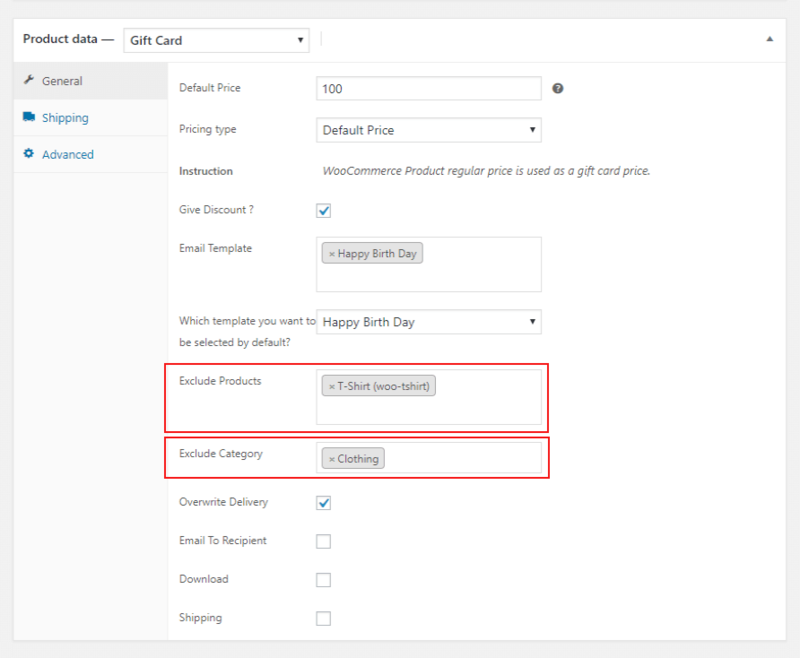 (ii) Once downloaded install WooCommerce Ultimate Gift Card plugin through browsing and activate it. Manual installation of the plugin is another option to install the plugin to your WordPress-environment. The manual installation method involves downloading our WooCommerce Ultimate Gift Card Extension and uploading it to your web server via your favorite FTP application. 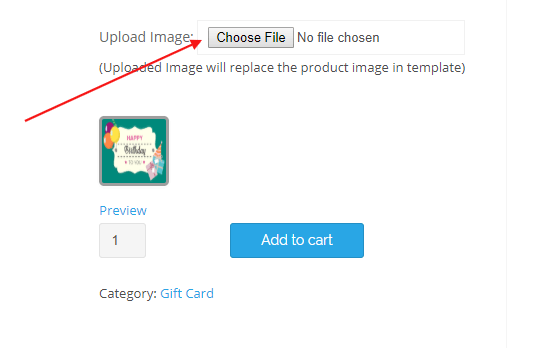 (i) Upload the WooCommerce Ultimate Gift Card folder to the /wp-content/plugins/ directory. 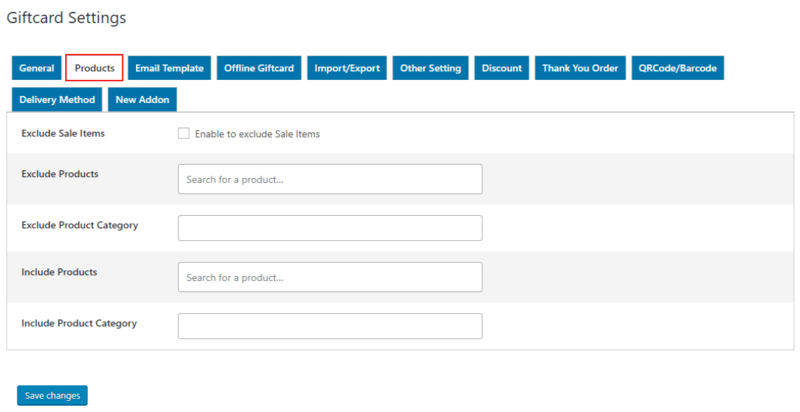 (ii) Activate the WooCommerce Ultimate Gift Card plugin through the ‘Plugins’ menu in WordPress. 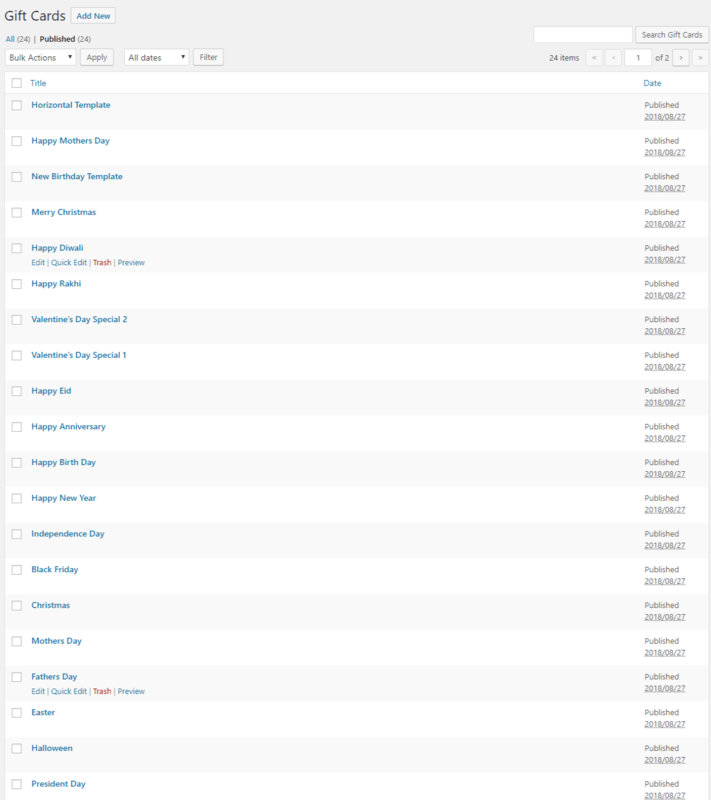 After activation of plugin WooCommerce Gift Card, a custom post type “Gift Cards” is created. From here Merchant can create as many Gift Card Templates as he wants. WooCommerce Gift Card plugin already provides some gift cards templates, which is automatically created on plugin activation and it will help the merchant to create new gift cards. To create a new Gift Card Template navigate to the sidebar and click on Gift Cards > Add New. Here you can design your template by using custom CSS. HTML and you can also use the shortcode.  A separate gift card type product is created in WooCommerce and merchant can create as many of product as he wants. (1) For creating new Gift card, select a Gift Card as product type and set up product name, description, image and other detail required for a product. (2) Here Merchant can select different type of pricing for Gift Card products. (3) Give Discount: Enable discount on Gift Card Products. (4) Select Email Template: Select Email Template or multiple Email Templates. 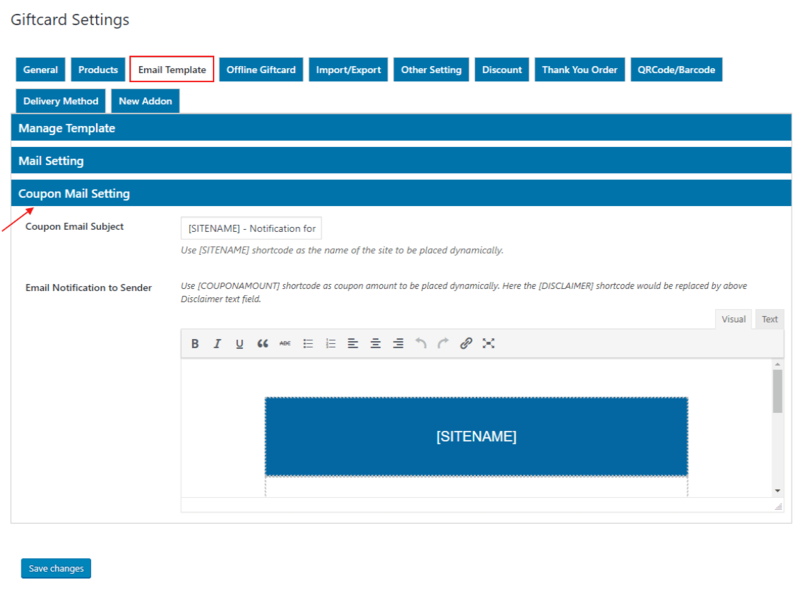 (5) Select the Default Template: If you use multiple Email Template then you choose a default template which you want to be select by default. (6) Exclude Product: The merchant can also exclude a selected product from Gift Card discount. When any excluded product is available on the cart, then the Gift Card discount is not applied. (8) Overwrite Delivery: In this setting, set per product delivery methods for a product that your customer used to send their Gift Card email to their recipient. And the last click on the ‘Publish‘, your Gift Card product is successfully created. Now your customer can easily purchase the Gift card from your shop. The customer can also schedule the time to send the gift card email to their recipient. Leave blank, the email will be sent instantly after placed the order successfully. 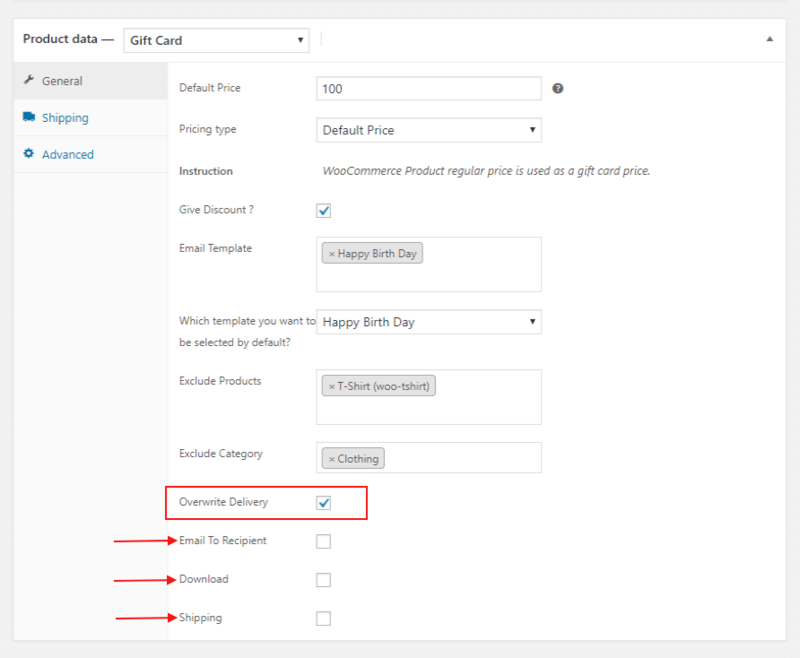 Enable: Check this box to enable the WooCommerce Ultimate Gift Card plugin. Enable Tax: Check this box to enable the tax on Gift Card products. 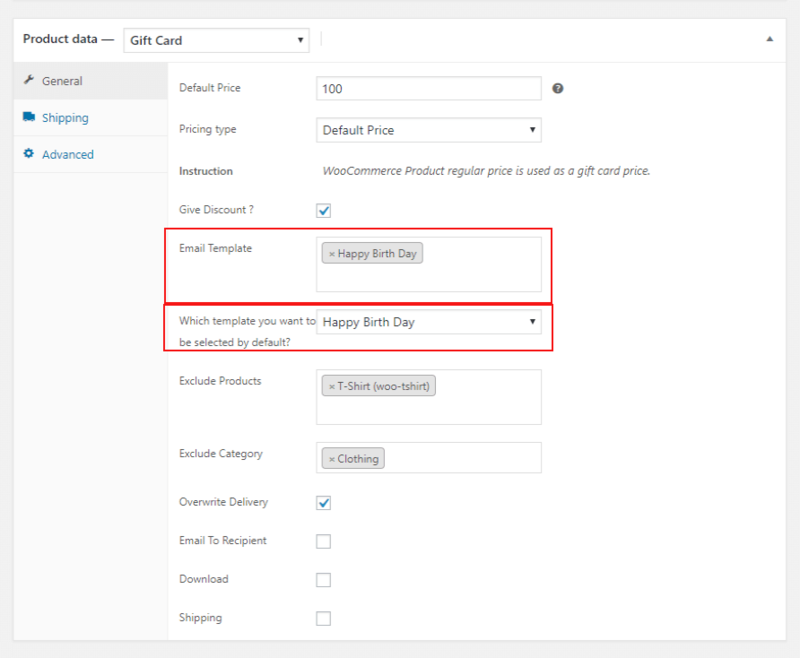 Enable Date Feature: Check this box to allow the Gift Card products to send to the receiver on the selected date. 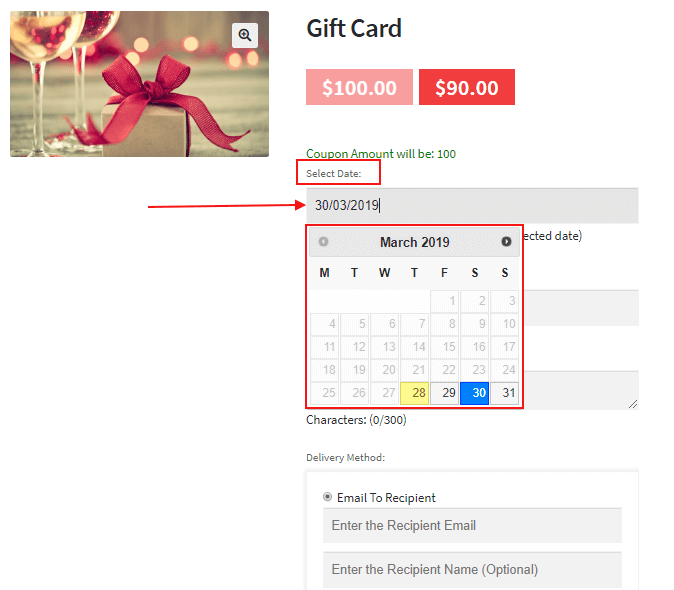 Date Format: Select the date formate which you want to show on the Gift Card. Enable Listing Shop Page: Check this box to allow the listing of Gift Card products on the shop page. Individual Use: Enable this setting if the Gift Card coupon cannot be used in conjunction with other Coupons/Gift Cards. Free Shipping: Check this box if you want to enable the free shipping for the Gift Card products. Giftcard Coupon Length: Enter Giftcard coupon length. The minimum length of the coupon is 5. Giftcard Prefix: Here enter the Gift Card prefix for coupon code. Giftcard Expiry After Days: Enter a valid number after that a purchased Gift Card will be expired. keep value 0 for no expiry date and value 1 for one-day expiry when the order is completed. Minimum Spend: This setting allows you to set the minimum spend of a Gift Card. Maximum Spend: This setting allows you to set the maximum spend of a Gift Card. Giftcard Number of Time Usage: How many time a Gift Card can be used before Giftcard going to empty. Enable Payment Gateway For Giftcard: Here choose the separate payment gateway method for Gift Card Products otherwise default payment gateways will be work. Disable category: Check this box only if you want to change the category for Gift Card Product. You have to select the category every time when you create a Gift Card product. Default Gift Card category will not be assigned automatically. Here you can include and exclude the products categories for the Gift Cards. Exclude Sale Items: Check this box if you want to enable the Gift Card Coupon should not apply on the sale items. Excludes Products: The merchant can also exclude a selected product from Gift Card discount. When any excluded product is available on the cart, then the gift card discount is not applied. Exclude Product Category: The merchant can exclude categories to which he doesn’t want a gift card discount. When any excluded category product is available on the cart, then the gift card discount is not applied. Include Products: Select products on which Gift Card coupon will be applied. Include Product Category: Gift Card coupon will be applied to the product of the selected categories. You can also exclude the products and categories for the specific product. Goto the product edit page and click on ‘Product data‘ section, here you can exclude the products and category from the gift card products. An email template is sent to the user to notifying about their Gift Card, Gift Card Coupon etc. 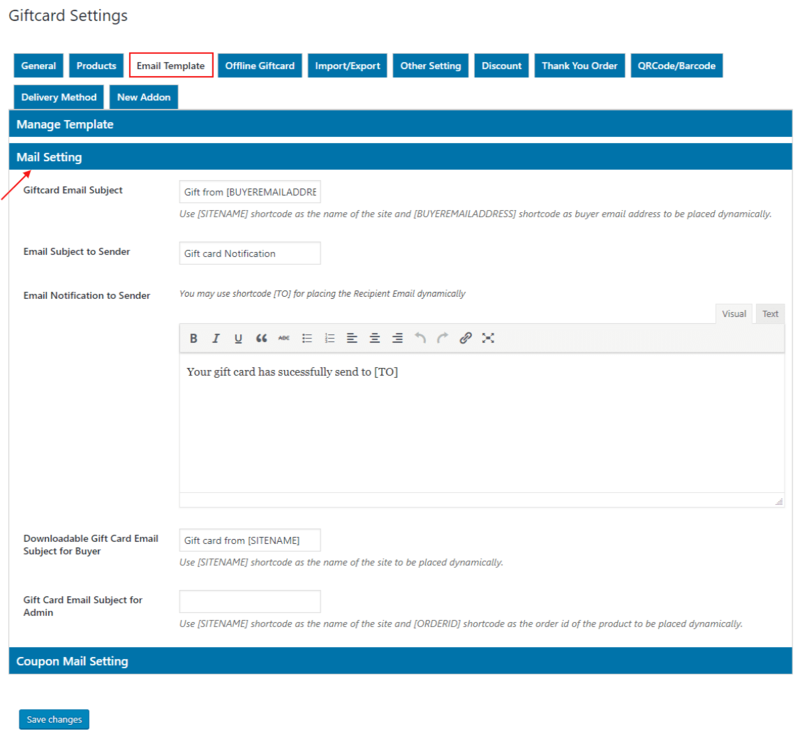 The merchant can manage their email templates with the giving settings. In this section, you can design your email template. Upload Default Logo: Upload image which you want to use as the logo on the email template. Logo Dimension (in “px”): Set the size of the logo in pixels. Email Default Event Image: Upload image which you want to use as default event/occasion logo in the email template. 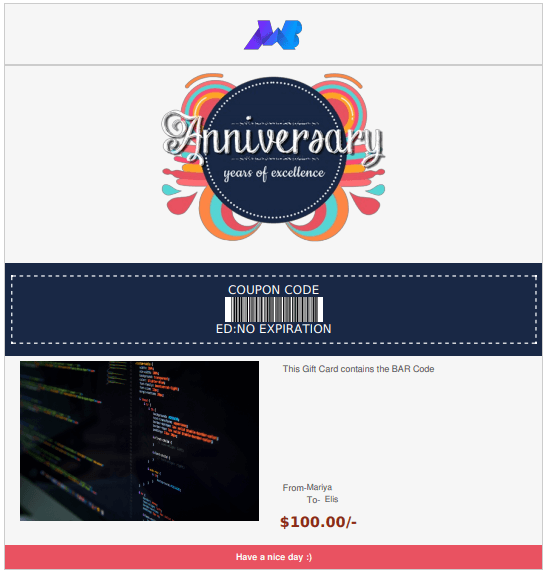 Email Background Color: Here merchant can change the background color of the email template. Giftcard Message Length: The merchant can set the Gift card message length by setting. The Default length of Gift card message is 300. Along with this, we have provided the customers to check the current count of the message characters. Disclaimer Text: Here you can change the disclaimer text for the email template. Here you can see the frontend email template. Use this email template to acknowledging the buyer for their giftcard. Giftcard Email Subject: Use [SITENAME] shortcode as the name of the site and [BUYEREMAILADDRESS] shortcode as the buyer email address to be placed dynamically. Email Subject to Sender: Write an email subject of the email template for the receiver. Email Notification to Sender: Write the message for acknowledging to the buyer for giftcard has been sent successfully. You may use the shortcode [TO] for placing the Recipient Email dynamically. Downloadable Gift Card Email Subject for Buyer: Downloadable Giftcard email subject for giftcard mail when received by the buyer. Use [SITENAME] shortcode as the name of the site to be placed dynamically. Gift Card Email Subject for Admin: This is the subject for the Giftcard mail that will be sent to the admin when the buyer purchased the giftcard so that he can ship it to the shipping address. Use [SITENAME] shortcode as the name of the site and [ORDERID] shortcode as the order id of the product to be placed dynamically. The user will get notified about their each usage of coupon amount with the email. And the user can check how much amount is left on their coupons. Coupon Email Subject: Write the subject of coupon mail. Use [SITENAME] shortcode as the name of the site to be placed dynamically. Email Notification to Sender: Write the message to notify the user about their coupon amount. Use [COUPONAMOUNT] shortcode as coupon amount to be placed dynamically. Here the [DISCLAIMER] shortcode would be replaced by the above Disclaimer text field. Through this section, the admin can import Offline Coupons. Through this section, The Merchant can create gift cards from the dashboard as per user request and send it to the recipient. The merchant can also export the CSV of Gift Cards. To create a new Gift Card click on ‘Add New‘ tab, a popup window will be displayed. Here you can fill out all the details of the gift card. After successfully created a giftcard clicking on ‘Preview‘ button to view the Gift Card and last click on the ‘Save & Send‘ button. You can view detail of all shipped giftcard by clicking on the ‘View List‘ tab. Through this section, you can import Gift Coupons. Through this section, you can import Gift Products. In this setting, we provide some extra options i.e. BCC, Enable/Disable some option that user need to change. Enable Bcc option for Giftcard Mails: Admin can enable the BCC feature for gift card mails. BCC (Blind Carbon Copy) is a copy of an email message sent to a recipient whose email address does not appear (as a recipient) in the message. 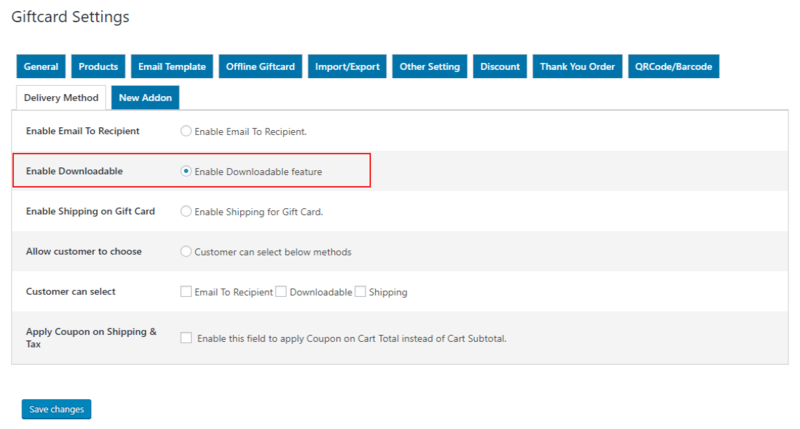 Disable Apply Coupon Fields: Admin can disable the apply coupon field which is applied to each order amount. Disable Resend Button: Resend button is used to resend the gift card product mail to the recipient. Admin can disable the resend button option. The user can also resend the email to the receiver to which he wants to send gift cards. Disable Send Today Button: Send Today button is used for sending the gift card Admin can disable the send today button option. the customers can select the date they wanted the gift card to be sent to the recipients. Customers can also send the scheduled Gift Card on the current day through the order details section. Disable Preview Button: Preview Button is for the sender that he/she views their gift card template before sending the recipient. Admin can disable the preview button as they need. Enable Pdf Feature: After enabling this feature customer will get an email along with PDF attachment. Select the Pdf Template Size: After enabling this feature customer will get Giftcard email along with attached pdf. Enable Browse Image for Gift Card: After enabling this feature customer will browse the image for Gift Card Product. Text for ‘Email To Recipient‘section. Enter the description will get displayed below the ‘Email To Recipient’option. Text for ‘You Print & Give’ section. Enter the description will get displayed below the ‘You Print & Give’option. Text for ‘Ship Your Card’ section. Enter the description will get displayed below the ‘Ship Your Card’option. Making Optional ‘To’ Field: Check this box if you want to remove the validation from ‘To’ field. Making Optional ‘From’ Field: Check this box if you want to remove the validation from ‘From’ field. 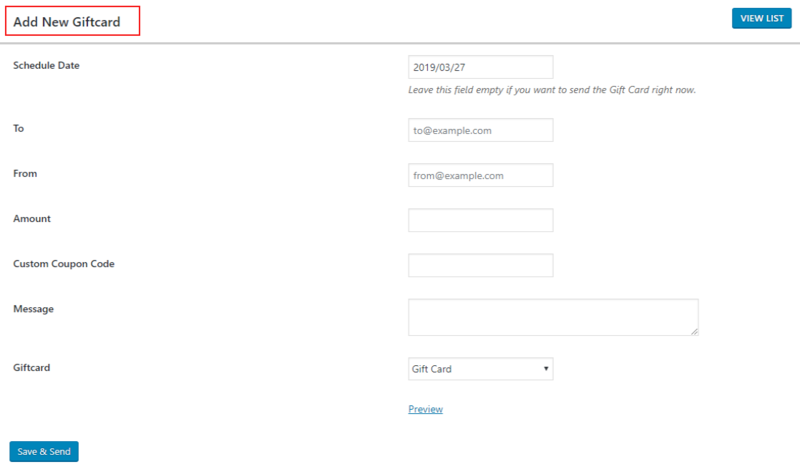 Making Optional ‘Gift Message’ Field: Check this box if you want to remove the validation from ‘Gift Message’ field. 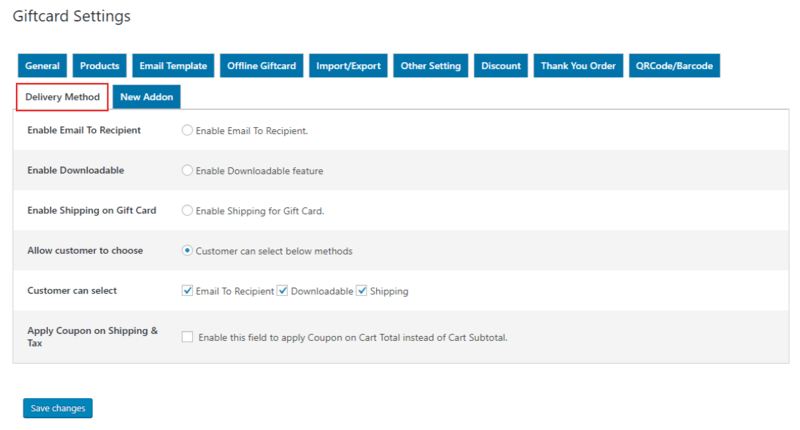 Manual Increment usage count for Gift Coupon: Check this box if you want to allow manual increment usage of Gift Coupon. 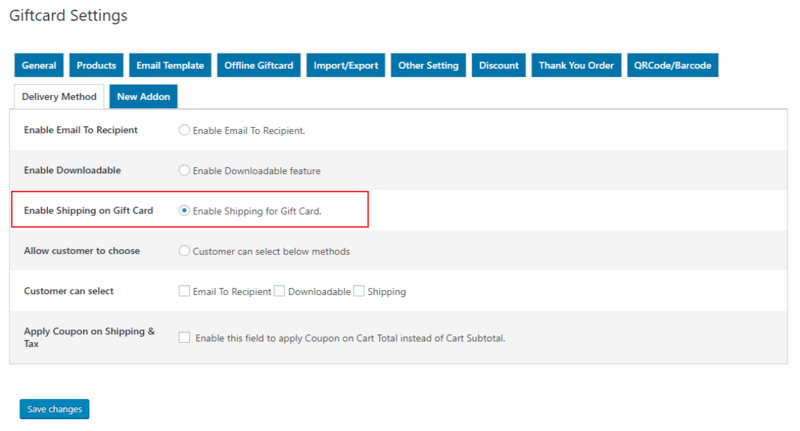 Enable Product for Custom Page: Check this box if you want to display the Gift Card product on the custom page. Hide Giftcard Notice: check this box if you want to hide Gift Card notice from the product page. Hide Featured/Thumbnail Image: Check this box if you want to hide the features images from the product page. Disable Buyer Notification: Check this box if you want to disable the notification to the buyer about there Gift Card has been sent. Email for Ship your Card Delivery Method: Enter a mail where you want to mail the gift card when customer chooses delivery method id ‘Ship your card’. by default mail send to the admin. Here merchant can enable the discount amount on Gift Card products. Enable Discount on Giftcard Products: Check this box to enable the discount on Giftcard Products. Select Discount Type: Choose the discount type for giftcard products either fixed or percentage. Enter Discount within Price Range: Enter discount within the maximum, minimum price range and discount amount. Select Discount Type is Fixed: Select discount type is fixed from the dropdown. Set the Discount Amount with Price Range: After selecting the discount type, set the discount amount with the price range. See the discount amount on the frontend. 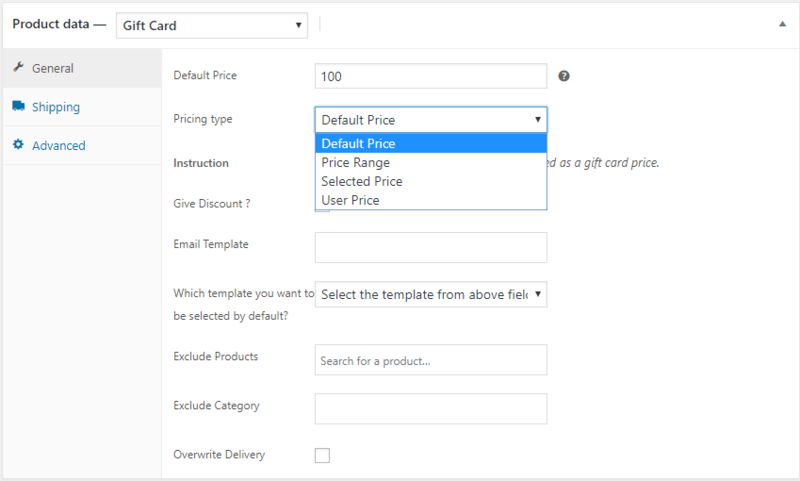 Select Discount Type is Percentage: Select discount type is percentage from the dropdown. The merchant would be able to send Thank You gift coupon to their regular customers, who have placed the required number of order for that coupon. Want to give ThankYou Gift coupon to your customers: Check this box to enable gift coupon for those customers they had placed orders in your site. Select the Order Status: Set the status when the Thank you giftcard coupon would be sent. Number of Orders, after which the thankyou giftcard would send: Enter the order number after that you want to give the giftcard coupon to your customer. ThankYou Coupon Expiry: Enter the number of days for coupon expiry. Keep value 1 for one-day expiry after generating the coupon keep value 0 for no expiry. Select ThankYou Gift Coupon Type: Choose the thankyou coupon type. It either fixed or percentage. Enter a Thankyou Message for your customers: This message will print inside the Thank You template. You may use shortcodes [COUPONCODE], [COUPONAMOUNT] and [COUPONEXPIRY]. Enter Coupon Amount within Order Range: Enter the thank you coupon amount with the price range. The QR Code/BAR Code is used over the Gift Card for providing the security. Enable Barcode: If the user wants to generate their BAR Code with the Coupon code so here we give the option for the merchant to allow your user to generate their BAR Code with the Coupon Code. Display Code: Check this box to display the coupon code below the Barcode. CodeType: We have given some code type use for BAR Code, which is going to be used in different places for a different purpose. Size: set the size of barcode. Enable QRCode: Enable QRCode to display in Email Template. QRCode displayed instead of coupon code. ECC Level: This compensates for dirt, damage or fuzziness of the BAR Code. Valid values are “L” (low ECC), “M”, “Q”, “H” (highest ECC). A high ECC level adds more redundancy at the cost of using more space. You can see the QR Code on the frontend. In this setting, we provide three delivery options to the buyer that he send their gift card email to the recipient. Email to recipient feature is used for sends the gift card via email only to the recipient. On the frontend, you can see the normal delivery method to send the Gift Card. In this feature, the gift card email is sent back to the buyer. The buyer will download the email and send it to the recipient with the needed method. On the frontend, you can see the option of print your giftcard. In this feature gift card email is sent to the admin and admin will deliver the gift card to the shipping address of the recipient. After enabling this setting you can see the shipping option on giftcard. The customer can choose the method for gift card delivery i.e; Email to Recipient, Downloadable, and Shipping. 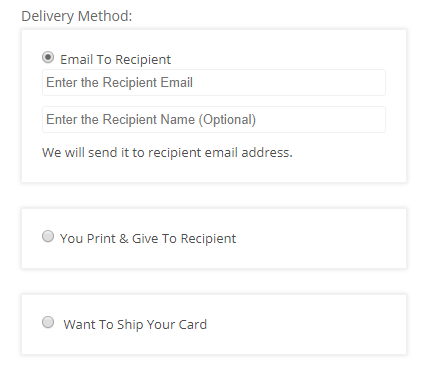 (i) Customer can select: From this section enable the delivery methods for the customers. After enabling this feature you can allow the customer to select the delivery methods within three delivery methods for the Gift Card products. 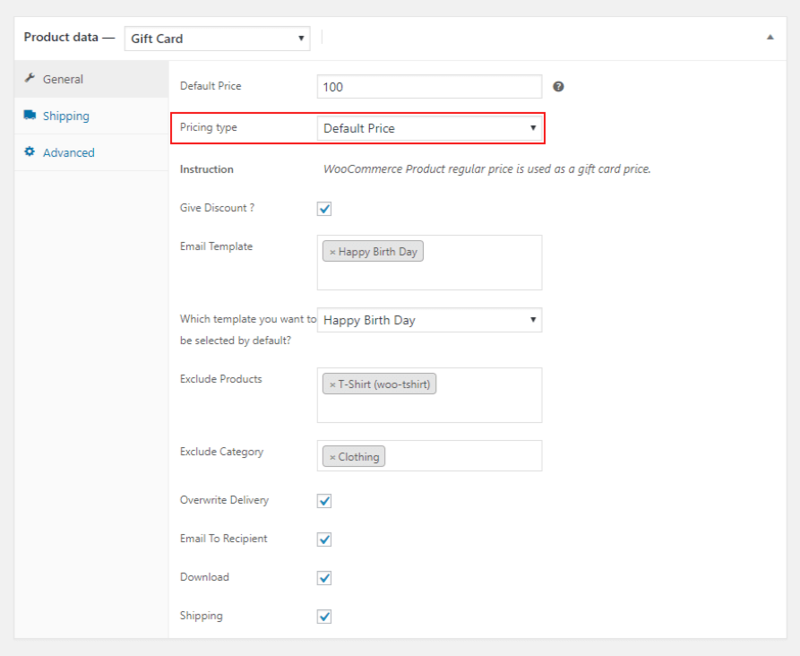 In this feature, the user can also apply their coupon for shipping and tax i.e, Total amount of Gift Card product. 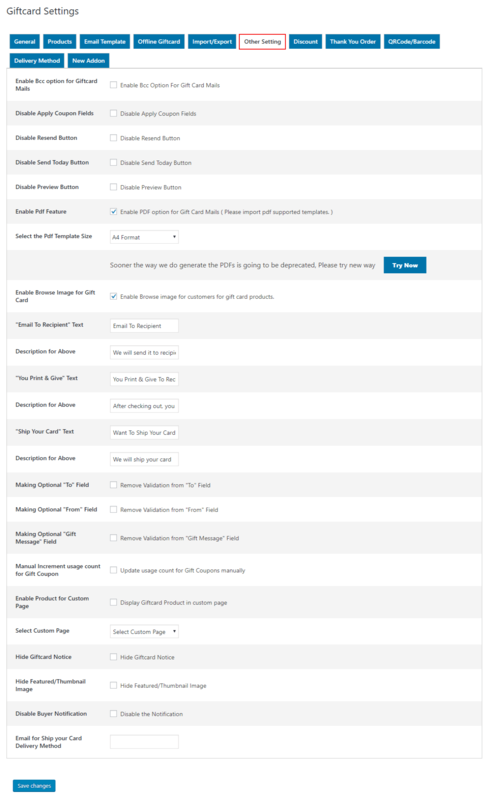 This setting allows you to set the per product delivery methods. 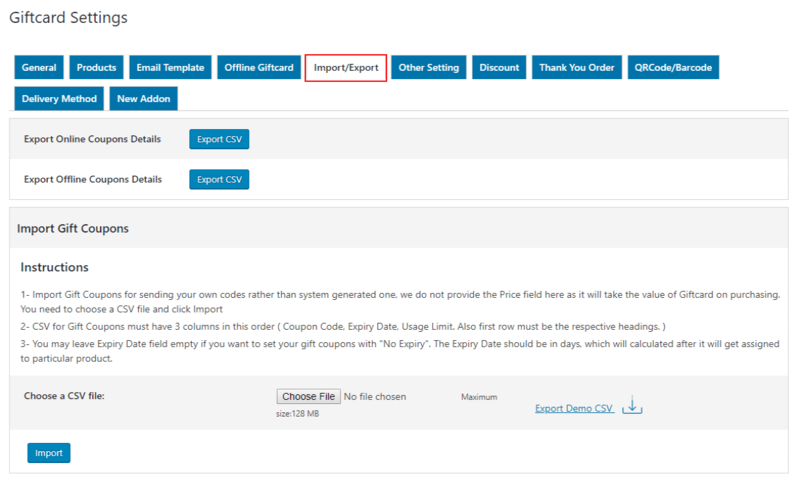 Goto ‘Product edit page‘ and click on ‘product data‘ section, here you can see the ‘Overwrite Delivery‘ setting. 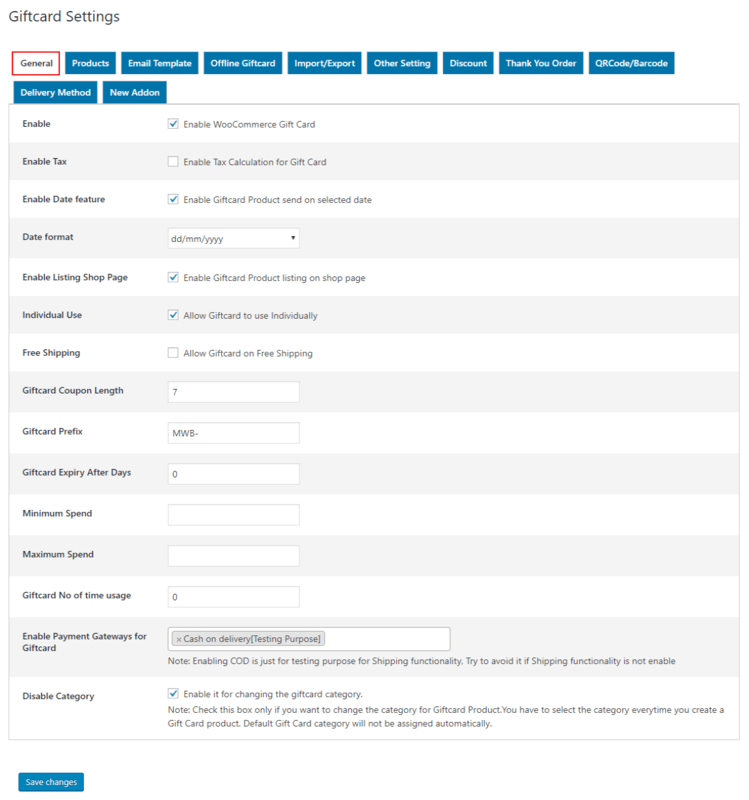 Enable this setting and select the delivery methods for the specific product.